In my INBOX today was a nice little newsletter and invitation from Grant Pound of the Colorado Art Ranch. The timing wouldn’t be right for me this coming year…………..BUT it sounds wonderful. Maybe it would be a great adventure for some other artist. Do check it out and think about applying for a residency there. It should be unforgettable and inspirational. We are planning on having three residencies for 2009. This gives us the chance to serve more literary and visual artists as well as rural Colorado communities. So far one is set in stone (or at least pixels). The others will be announced as the information develops. We hope you will consider applying and spread the word to other artists. Colorado Art Ranch will host visual and literary artists in Trinidad, Colorado. The residency begins April 17, 2009 and ends May 18, 2009. Deadline for applications is February 1, 2009. We have an unusual and very cool housing option this time. Residents will be housed in the Holy Trinity Convent (no longer active) in the heart of historic Trinidad. The convent features a large kitchen and an exercise room. Residents will be our guests at the Artposium in Trinidad. Read FAQs, and apply at online. Nestled against the foothills of the Rocky Mountains halfway between Santa Fe and Denver, Trinidad retains its Old West character and the vitality of its pioneering days on the Santa Fe Trail. The community celebrates its colorful past while embracing new public projects. We have plans for a residency in Salida that will (hopefully) take place in the Summer. The Fall residency will be near Paonia, Colorado. Stay tuned. This link will take you to some more photos as the kitchen is today on the day after Christmas. I hope everyone had a wonderful Christmas Day. I wish you all good fortune and a healthy, happy New Year for 2009! 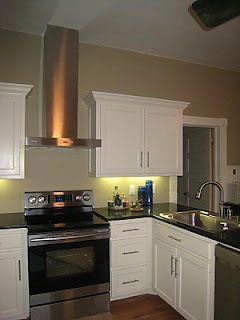 As everyone who reads this blog knows, I haven’t had a real kitchen for some time. Today I needed to make something to take to a TX Wax meeting on Sunday and some cookies for a Christmas Cookie exchange party on Monday. We’ve been using the old gas range in the kitchen of my studio so I put my fresh apple cakes in the oven and went about my business. I came to check on them about an hour later to determine how much longer they had to bake and clicked in 15 more minutes. It hardly registered that the oven wasn’t as warm. When I came back later, it did. The darn oven went out on me right in the middle of all this stuff I had to do. Yikes…………out to the well house to drag out the old toaster oven and I put them in one at a time and baked and turned and baked and turned. I’m crossing my fingers on this one but Curry said the middle of one of them seemed good to him. So I’ll take the other one to the meeting. Knowing this wasn’t going to work for the cookies, I begged him to pull out my new oven/range and plug it in for cookie baking. The electricians only finished their work yesterday and I have no counter-tops yet. So I did all the cutting and slicing upstairs and went up and down, back and forth until they were all baked. I’m tired………and went to get burgers for dinner…off to bed early I think. I have done a few art related things…put hangers and wire on a couple of my latest paintings. Yesterday I had to make a run to Dallas to deliver some work. SO, art and art business continues, only not as I would like right now. Oh, and I added a couple of pages to my website since I’d forgotten to make pages for a couple of paintings. Maybe this time next week my new kitchen will be in better working order……….most of it anyway. 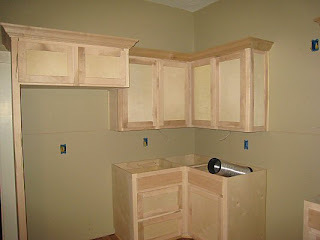 The cabinets were installed a couple of days ago. Did I ever mention I hate painting anything but paintings? WELL, I hate painting cabinets even more than ceilings and walls. 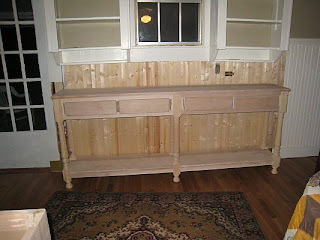 Here are a couple of pictures before the painting started. We have to paint because if you want white cabinets in the color of white you choose, it seems you can’t really buy already finished unless you get some kind of plasticized thermofoil or something. SO, we had a local cabinet man come in and make these to fit the space. This is an old country farm house but I like a lot of contemporary things so I will have Euro drawer pulls, a lot of stainless steel, Euro styled exhast fan, stainless steel up to the ceiling, black quartz countertops and mix it all up with all the old oak furniture. The cabinet man had the nifty idea of making me a free-standing server instead of just building it into the wall with legs in front. It’s 89 inches long, and 15 inches deep. It will be great for a server for big family get-togethers or just for serving coffee. AND, it makes for a good reason for leaving the old cabinets and the window above it where the old kitchen sink used to be. I’ve been thinking of making a mosaic ceramic top….BUT I HAVE TO PAINT in the studio, I hope soon. 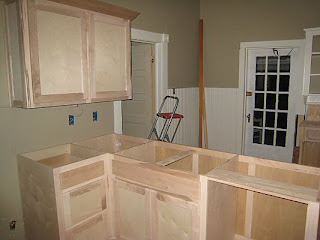 Back to my rant about hating to paint and priming cabinets………We have have certain amounts of it done so the electricians can come back for the rest of their work and also putting in the under cabinet lights……..When will I ever get a sink again?